American app tracking company Flurry has realeased some data showing that iPhone apps in the US are now as big as prime time TV shows. 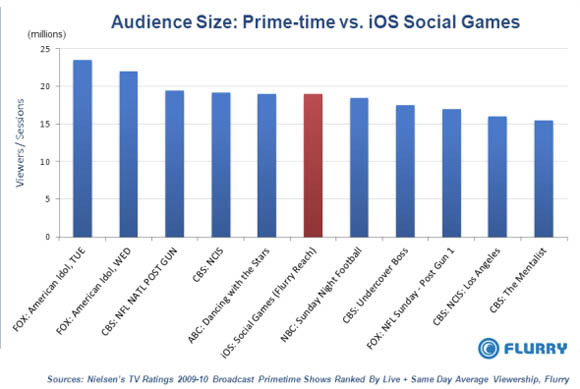 In a blog post, Peter Farago of Flurry claims that "Social games on iPhone, iPad and iPod touch devices are competing for television viewers". Personally, I doubt it; in my experience they're either used with the TV on at the same time, or at times when you couldn't watch TV anyway - like on the train. Still, they might be competing and they might not. The data doesn't tell us either way though. Let's have a look. Wow, that's impressive! Social games on the iPhone are bigger than Sunday Night Football on NBC! Before you dump TV from your plan, what's the catch? Nothing about this chart suggests that the iPhone is competing with TV. Even if the data is as stark as represented here (which I don't think it is), there's nothing to say TV viewers are switching off and playing iPhone games instead. All the iPhone apps aggregated into one bar and all the TV programmes separated out? Now come on chaps, that's not really a fair fight is it? The Flurry blog post talks about minutes of use, penetration and frequency but that's not what's on the chart, which shows number of viewers divided by number of sessions. That's a cracking way to mask the fact that the TV shows don't have exactly the same audience every week, so their overall reach is higher than the chart suggests. When you add this point to the previous issue (that all the TV programmes are separated out) you're potentially vastly underestimating the overall reach of TV vs. apps. Those TV programmes are an hour long each. Flurry themselves claim people spend 22 minutes per day using iPhone apps. How attention grabbing is a TV ad vs. an in-game game ad...? ... and so how effective is a TV ad likely to be vs. an in-game ad? Marketing first? Not a chance.